Iffound guilty of stealing and conveying an official record of the UnitedStates,the two men could each face up to 10 years in prison and a $250,000fine,according to the United States Attorney's Office. Customsand Border Protection (CBP) technician Thomas Chapman was working atLoganInternational Airport in Boston on March 13, when he came into contactwith Mr.Armstrong, who had just returned from overseas visiting with U.S.troops aspart of the "Legends of Aerospace Tour" organized by MoraleEntertainment. Armstrong and his fellow famous aviators and astronautswere scheduledto land in New York City but severe weather diverted their plane toMassachusetts. Chapmancollected Armstrong'ssigned declaration form as the moonwalker passed through theairport'scheckpoint and even assisted the astronaut with carrying his luggage tothe busthat would takehim to New York. Instead of properly filing the form withDepartment ofHomeland Security officials however, authorities say Chapman kept thedocument. Thenext day, Chapman is alleged to have brought the signed form to thehome ofPaul Brickman and together, prosecutors say, they solicited help fromanindividual with experience dealing with collectible signatures. Inturn, thatindividual consigned the document to RR Auction, a New Hampshire-basedauctionhouse that specializes in selling celebrity-signed material, includingastronaut autographs. OpeningMay 22 for bids at $200, the NeilArmstrong customs form, which also included the moonwalker'saddress andother personal details, reached $1,026 before being pulled by theauction housein response to hearing from a former client with concerns over thelegality ofthe sale. "Myfirst concern is over the legality of offering sucha recently signed government document for sale," wrote the concernedautograph collector, who shared the e-mail he sent withcollectSPACE.com oncondition of anonymity. "Itmust have been sent to you by the federal employee responsible for itwithindays of it being signed. Shouldn't it be in a government file somewherewithall the other ones from that date?" he asked. Thecollector wrote Tuesday that RR Auction "did the right thing veryquicklywhen it was called to their attention." The document was turned over tofederal authorities soon after the company removed it from theirwebsite. In1994, Armstrong ceased signing, citing in part internet sales of hisautograph.Since then, photos and other items with his authentic signature havesold forthousands of dollars. Thisis the second high-profile, federal theft case involvingastronaut-relateditems in as many months. In June, a former NASA contractor employee waschargedwith stealing first U.S. female astronaut SallyRide's flightsuit in addition to several space shuttle artifacts. 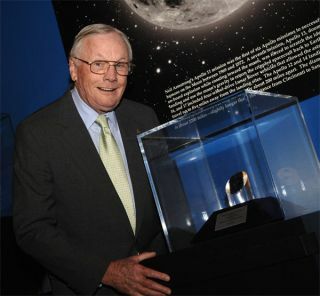 Clickthrough to collectSPACE.com to see Neil Armstrong's allegedlystolen signeddeclaration form.